MSI has more experience designing and manufacturing piezocomposite sonar transducers and arrays than any other company. Since 1991, naval, scientific and commercial sonar customers have repeatedly turned to MSI for assistance with their sonar performance challenges. MSI's reputation for delivering innovative and cost-effective sonar array products using our distinctive injection molded piezocomposite sonar transducer technology has grown over the years. Today you can find MSI sonar transducers enhancing the acoustic performance of sonar systems in all parts of the world. Broadband performance is becoming increasingly important as new frequency modulation techniques and multi-ping sonar applications are being introduced into the undersea community. MSI's inherently broadband piezocomposite technology has improved sonar performance and resulted in a competitive advantage for many customers. The conformal shape capability, powerful transmit response and high receive sensitivity of MSI injection molded piezocomposite sonar transducers are enabling a new generation of littoral sonar systems. MSI's patented ceramics injection molding process efficiently produces piezocomposite material in high volume with excellent uniformity. Our ability to fabricate piezocomposite in large sheets allows cost-effective manufacturing of layered arrays having multiple elements and complex shading. MSI's proprietary array curving and laminating techniques and custom acoustic backing and matching layer materials are enabling new sonar array designs that can produce the complex beam-patterns, high sensitivity and broadband performance essential for successful sonar operation in today's littoral environments. MSI has an experienced staff of scientists, acoustic designers, mechanical engineers, and technicians who can develop custom sonar transducers and arrays to meet your system upgrade or new product engineering needs. During the transducer design process, our engineers work closely with each and every client to ensure that the resulting MSI sonar array products fully meet customer-specified electromechanical requirements and are optimally integrated with each customer's signal processing electronics. The solution for each customer - and each application - is unique, but utilizing MSI's "concept-to-production" capability, we can efficiently develop and manufacture transducers that provide you with the best overall value. Once the engineering and prototyping are complete, MSI has the manufacturing, testing and quality assurance infrastructure needed to provide you with sonar transducers and arrays in full scale production. Our process is largely vertically integrated, with full control over all raw materials. Our injection molding production capacity for piezocomposite is substantial, sufficient to meet the needs of even the largest volume sonar array customers. All MSI processes are thoroughly documented and our products are manufactured under rigorous quality control. For those customers who need them, we can implement additional quality assurance procedures to meet their special requirements. Over the past decade, MSI has successfully designed and delivered piezocomposite transducers to a variety of customers for industrial applications, including: ultrasonic flow sensors, medical ultrasound, non-destructive testing and in-process inspection and quality control. MSI has designed transducers to withstand the most severe environments normally encountered in industrial applications, including temperatures ranging from -40°C to >150°C and pressures up to 25,000psi (170MPa). Frequencies can range from 25kHz to over 1MHz. In addition MSI can produce large line and area arrays or roller transducer arrays for scanning large areas of industrial materials at high speed. MSI has licensed patented* Active Fiber Composite (AFC) patch actuator technology and is making these devices available for volume production applications such as energy harvesting and vibration control. AFCs are thin, flexible, piezoelectric devices that can provide cost-effective actuation and sensing over large areas. They offer many advantages over monolithic piezoceramic, including higher actuation strain, unidirectional actuation, damage tolerance, and conformability to curved surfaces. AFCs are ideal for smart structures, sound and vibration control, acoustic transducers, and energy harvesting for powering wireless sensors and handheld devices. Exceptionally high actuation strains of 1800 ppm and blocked forces of 110 pounds are possible for large 50 x 125mm (2"x 5") AFCs. MSI's AFC design consists of aligned piezoceramic ribbon fibers in a tough, flexible, polymer matrix. MSI is unique in its use of proprietary injection molding techniques to manufacture piezoceramic "combs" that are pre-assembled and pre-aligned to reduce AFC fabrication cost. The molding process also facilitates rectangular fibers, which perform better than round fibers in AFC devices. MSI's vertical integration, from piezoceramic development and manufacture to AFC design and assembly, provides exceptional flexibility to meet unique customer application requirements. The composition, design and size of MSI injection molded AFCs can be selected to provide the best combination of performance and cost for most high volume applications. MSI's piezoelectric composite materials are an excellent choice for sonar and ultrasound applications. They provide high electro-mechanical energy coupling to water, air, plastics, composite materials and other low acoustic impedance media. Transducers made from piezocomposite are highly efficient and inherently broadband. 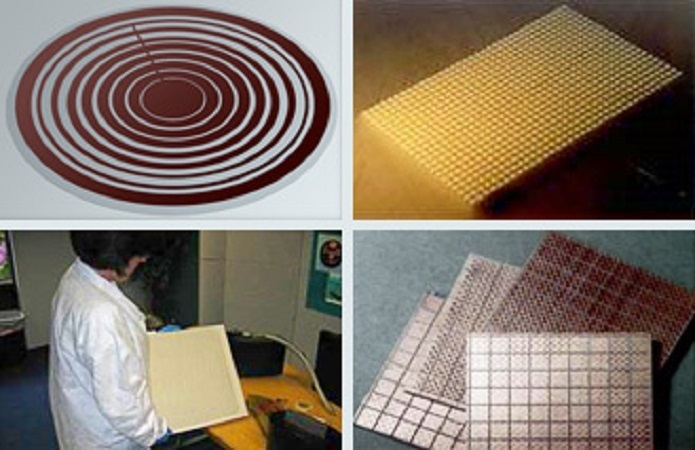 Most of the piezocomposites that MSI manufactures for transducer applications are of the 1-3 type. These are made using MSI's patented piezoceramic injection molding process, which is capable of quickly producing arrays of piezoceramic pillars with the necessary dimensions and spacing. MSI offers a range of injection molded and diced 1-3 piezoelectric composite materials with resonant frequencies between 50 kHz and 1 MHz. Resonant transducer designs below 50 kHz can be achieved with mass-loading techniques. MSI offers special piezocomposite materials capable of operating at static pressures as high as 200 MPa (30 kpsi) and temperatures from -40 to >100°C. MSI's patented injection molding process is ideal for rapidly manufacturing large numbers of piezoceramic parts in complex shapes and configurations. For example, injection molding can simultaneously produce dozens of tubes in an array either open or closed end with lengths of up to 25mm and diameters smaller than 1mm. Tube wall thickness can be as small as 100μm. The process offers a low-cost, shape-versatile alternative to the conventional machining and dicing methods now being used in various industries. Injection molding also offers consistently high quality components with a high degree of part-to-part uniformity. Ceramic injection molding can produce components with geometries ranging from flat plates and grooved arrays to serpentine structures and tubes. Several lead zirconate titanate piezoelectric formulations are available in injection molded form, including: MSI-53 (DoD Type VI), MSI-51 (DoD Type III), MSI-81 (DoD Type I). A lead magnesium niobate-based piezoelectric material (MSI-32) is also available.